Boston College Speaks Up About Divestment, Climate Justice | BANG. 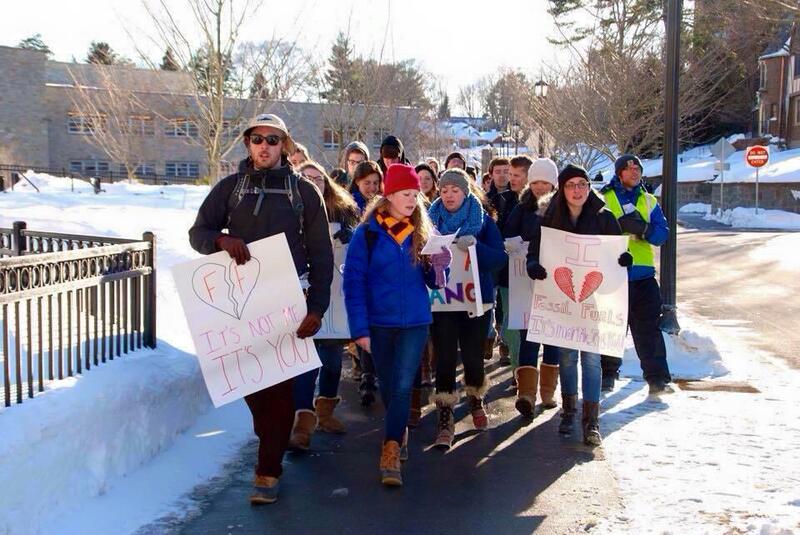 The divestment movement at Boston College took another bold step last month in the highest form of anti-Valentine’s Day themed protests. On February 13 at 3 p.m., Climate Justice at Boston College (CJBC), an on-campus student divestment group, led a crowd of approximately 45 students, marching from O’Neill Plaza to President William P. Leahy, SJ’s office on Mayflower Road and calling for BC to “break up with fossil fuels” by divesting from fossil fuel companies. The group defines divestment as “immediately freez[ing] any new investment in fossil fuel companies, and divest[ing] within five years from direct ownership and from any commingled funds that include fossil fuel public equities and corporate bonds,” according to the group’s petition. This march was one of many in the course of the group’s involvement on campus since December 2012, since which the fruits of the group’s passion and enthusiasm have been the founding of a Multi-School Divestment Fund and actively participating in a national movement which has so far succeeded in convincing 19 US colleges and universities to divest in some form from fossil fuels. While the topic has been dominated by student voices up to this point, the university ultimately plays the final card in the matter, and therefore is often portrayed as attempting to stifle the student voice. Director of Public Affairs and university spokesperson Jack Dunn sat down with The Gavel to discuss the University’s position on divestment and clear up some misconceptions about the reasoning behind that position, as well as the administration’s relationship with CJBC. First and foremost, said Dunn, the endowment’s purpose is to generate long-term investment returns. Coming in at $2.2 billion, the endowment provides students each year with $100 million in needs-based undergraduate financial aid distributed to approximately 37 percent of the student population, according to U.S. News 2015 rankings. Aside from this aid, the endowment is used toward funding the university’s academic, research, and student formation initiatives. While many see this explicit inaction as a form of political action in itself, Dunn sees the university’s position as an attribution to its strong character. “There will always be, on a college campus, issues that emerge that students are passionate about. Our position has been to let the endowment serve as an investment that generates revenue for the university, and not to subject it to societal pressures or political stances,” he said. The divestment movement has certainly spread far and wide across the country over the past two years, with major student groups existing here in Boston at Northeastern, Harvard, and MIT. However, Dunn makes the point that no major university in the US has fully divested from fossil fuel companies, and that the 19 who have pledged to divest are working with smaller endowments and therefore lower stakes. Dunn goes on to say that the inherently complicated process of divestment makes it difficult for many schools to divest, given that most investments are multi-layered and involve multiple parties. The reality of the situation, says Dunn, is that all major colleges and universities have holdings in some form or another in fossil fuel companies, as does any average American citizen with a 401(k). The complexities of the investments themselves make it difficult to divest, on top of the consequences that would be felt by programs and opportunities at universities that receive less funding because of divestment. The organization has in fact met with several university administrators, including Father Leahy, Vice President of Student Affairs Barbara Jones, the Board of Trustees and the University’s chief investment officer John Zona. While the meetings have been cordial and constructive, according to Dunn, the university’s position on the matter remains unwavering. “I believe in being honest with students, and I think the best thing we can do is to say, ‘We respectfully disagree with your perspective, and we do not intend to divest,’” said Dunn. Moreover, the university’s refusal to budge on divestment does not translate to a refusal to acknowledge a need for sustainability according to Dunn. Rather than divestment, Boston College has approached honoring the environment by encouraging students to reduce their own carbon footprints on an individual level, as well as the study of environmentally sustainable practices through the newly-implemented Environmental Studies major. “Boston College has achieved significant savings as a result of a major conservation effort that we enacted over the past decade. We have achieved millions of dollars worth of savings,” says Dunn. This is seen in campus-run programs through the Office of Sustainability, as well as in the University’s LEED certified buildings, a certification that denotes these buildings as “green” across several categories, including water efficiency and energy and atmosphere. “We think studying the issue of sustainability from an academic standpoint and promoting sustainability institutionally and among ourselves is the best way that we can achieve a reduction of our carbon footprint here at Boston College,” said Dunn. Furthermore, the university believes there is as of yet no viable alternative energy to oil, coal, and natural gas, which is, according to Dunn, why no college or university in the US has divested.